^ Keen, Rosemary (n.d.). "Church Missionary Society Archive, General Introduction and Guide to the Archive". ampltd.co.uk. Adam Matthew Publications, Pelham House. Retrieved 16 December 2016. 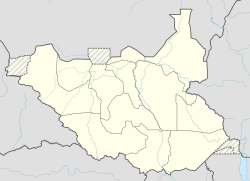 ^ a b "The World Factbook: South Sudan". World Factbook. Central Intelligence Agency. Retrieved 31 December 2013. ^ "Over 40 killed in plane crash, as Juba regrets the incident – Sudan Tribune: Plural news and views on Sudan". Sudan Tribune. Retrieved 22 July 2016.